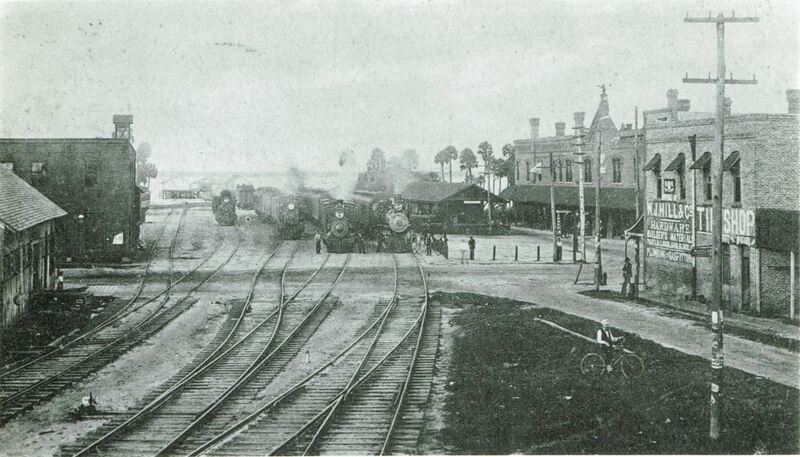 The Atlantic Coast Line (ACL) railroad depot located on West Eighth Street in Downtown Sanford, Florida, around 1900. W. H. Hill and Company can also be seen to the right side of the photograph. This depot was originally part of the South Florida Railroad, which held its groundbreaking ceremony for the new railroad station on Oak Avenue in 1880, with former President Ulysses S. Grant (1822-1885) in attendance. In 1893, the South Florida Railroad was bought out by Henry B. Plant (1819-1899) to save it from bankruptcy and incorporated into his own railroad system. Shortly thereafter, in the winter of 1894-1895, a freeze hit Sanford, destroying the entire citrus crop. This brought an end to what had been Sanford's thriving citrus industry prompting the development of its vegetable industry. By the 1900s, Sanford was one of the largest vegetable shipping centers in the United States gaining the nickname of "The Celery City" for its most successful crop. Upon Plant's death in 1902, his widow, Margaret Josephine Loughman, sold his railroad system to the Atlantic Coast Line (ACL). 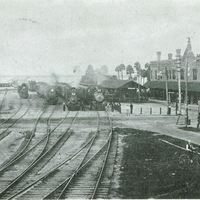 The arrival of the ACL in Sanford brought many new railroad workers as the city grew into a hub for shipping produce to surrounding areas. Rand Yard, the ACL's freight yard, housed a car shop, engine servicing facility, small locomotive shop, and the state's largest railroad ice plant. In the early 1900s, Lake Jesup farmers began demanding that the ACL build a line for them to ship their produce into town. The ACL refused; in response, the give biggest growers chartered the Sanford and Everglades Railroad with Sydney Octavius Chase, Sr. (1860-1941) as the president. The new line was completed as an ACL branch at Lake Charm. The ACL was prompted to buy out the new line in 1913 when the Seaboard Air Line (SAL) showed interest in buying it, thus incorporating the branch which became the most profitable in the ACL system. By the mid-1900s, the amount of good farmland was shrinking in Sanford due to development, driving farmers further south to farms with much more acreage. This, coupled with the establishment of Naval Air Station Sanford (NAS Sanford), turned the city's focus from agriculture to the military. In 1967, the ACL merged with the Seaboard Coast Line Railroad (SCL) and later was acquired by CSX. Today, the railroad station originally built by the ACL is no longer in use. Original 7.125 x 5 inch black and white photographic print: Vincent Collection, Sanford Museum, Sanford, Florida. Digital reproduction of original 7.125 x 5 inch black and white photographic print. Vincent Collection, Sanford Museum, Sanford, Florida. "Sanford - Auto Train, FL (SFA)." Great American Stations, AMTRAK®. http://www.greatamericanstations.com/Stations/SFA. "Our Evolution and History: CSX." CSX http://www.csx.com/index.cfm/about-csx/our-evolution-and-history/interactive-timeline/. "The Atlantic Coast Line Railroad, Standard Railroad of the South." The American Railroads: A Long and Storied History. http://www.american-rails.com/atlantic-coast-line.html. Griffin, William E. Seaboard Air Line Railroad: The Route of Courteous Service. Lynchburg, VA: TLC Pub, 1999. Johnson, Robert Wayne. Through the Heart of the South: The Seaboard Air Line Railroad Story. Erin, Ont: Boston Mills Press, 1995. "Atlantic Coast Line & Seaboard Air Line." Railroads Historical Society, Inc. http://aclsal.org/. Hensley, Donald R., Jr. "THE SOUTH FLORIDA RAILROAD: Part I Early Construction." http://taplines.net/southflorida/southflorida. Hensley, Donald R., Jr. "THE SOUTH FLORIDA RAILROAD: Part II The Race to Tampa." http://taplines.net/southflorida/southflorida2. W. J. HILL & Co.
“Atlantic Coast Line Sanford Depot.” RICHES of Central Florida accessed April 21, 2019, https://richesmi.cah.ucf.edu/omeka/items/show/5116.